The sounds around me are familiar - the quiet chirp of the depth sounder, the slap of the swell on the hull, and the gentle hum of the main engine behind it all. 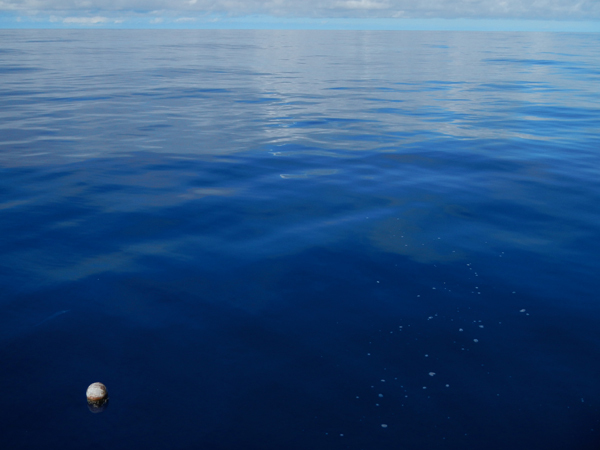 I am aboard the SSV Robert C. Seamans, where I have worked since 2011 as an assistant scientist with Sea Education Association, and we are motoring along in the middle of the South Pacific gyre on our way to Tahiti from New Zealand. 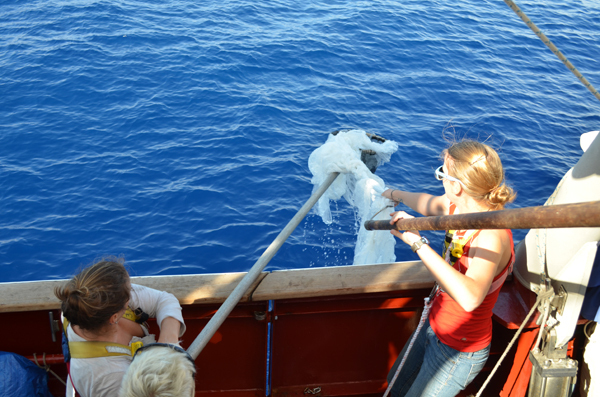 Sailing with a crew of 11 staff and 24 college students, we are sampling the waters on a six-week-long trip in which the students are specifically researching climate change-related projects, and after some Southern Ocean sailing we’re all excited to be in a new type of ocean system: the gyre. Gyres are created by uneven heating of the Earth’s surface, which causes atmospheric high-pressure zones centered at approximately 30 degrees on either side of the equator. Characterized by low winds, slow currents, and converging circulation, our gyre arrival has been noted by the crew because of the becalmed conditions we are steaming through. But to me, what is even more indicative than our lack of a sailing breeze is what we’ve been catching in our surface net tows these past few days: tiny, fragmented pieces of plastic no bigger than a grain of rice. And unfortunately, this too is a scene that is all too familiar to me. For the modern American, it is pretty difficult to imagine a world without plastics. From laptops and iPods to clothing to packaging and medical supplies, plastics are all around us. Once a highly sought-after material used exclusively by the military, plastic has become ubiquitous—even necessary in some cases—in daily human life. How did plastics rise to the forefront of modern consumerism? What happens to the millions of pieces of plastic trash that are thrown out daily worldwide? Where do they go? And what can we, as the average American consumer, do about it? Perhaps one of the most surprising facts in the plastic story, in the context of modern consumerism, is that its development was born from a conservation-minded desire to create synthetic alternatives to natural resources. As Captain Charles Moore discusses in his book Plastic Ocean, rubber, shellac, and ivory were all heavily mined natural resources by the end of the Industrial Revolution, and supplies were running out. One of the biggest drivers of the early chemical race to create durable synthetic alternatives was billiards, a hugely popular and nationally-followed game in the late 1800s and early 1900s. Early experiments attempted to make billiard balls that were lighter, less expensive, and shatter-resistant to replace dwindling ivory supplies. Despite billiards’ popularity, plastic development and experimentation lagged until government contracts in World War II provided necessary funding for synthetic items like shatter-proof glass and nylon for parachutes. Post-war, the consumer demand for plastic skyrocketed as it was introduced into the American household in the 1950s with the Wham-O company’s hugely popular hula hoop. Once product developers realized its potential—particularly with food packaging and single-use items like cups and personal care products—plastic was transformed from a military necessity to a household staple, and ushered in a new era of throwaway living. For the past four years I have spent more time at sea than on land, spending upwards of 9 months out of the year on the open ocean. I consider myself an eco-friendly individual and an ocean steward, and strive to impart my knowledge and love of the sea and the creatures in it to every student whom I sail with aboard SEA vessels. 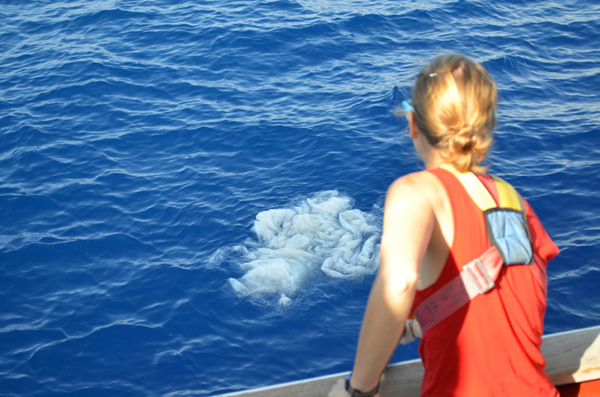 So when I had the opportunity to sail on SEA’s 2012 Plastics voyage in the North Pacific Subtropical gyre that focused specifically on plastic pollution and marine debris, I was excited but felt I already understood the issue pretty well. After all, I had already sailed to Midway Atoll in the North Pacific Ocean in 2011 and seen the devastation plastic waste had created there. One of the scientists there told us that albatross accidentally bring five tons of plastic a year to the island when regurgitating food for their chicks, so I thought I had a good understanding of the ocean’s plastic problem. I really had no idea. 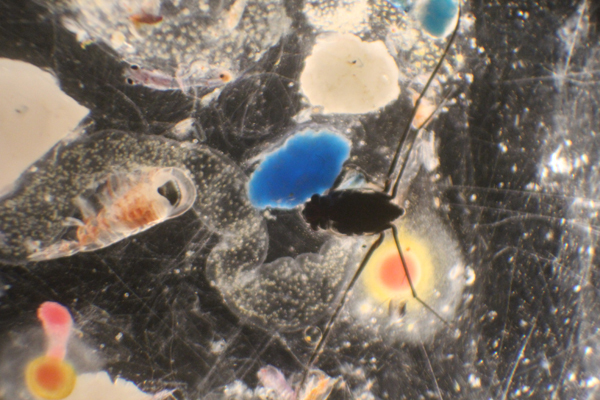 After sailing through the North Pacific Subtropical Gyre on that six-week trip from San Diego to Honolulu, sampling aggressively and exclusively for plastics with sometimes up to four net tows a day, I remember feeling overwhelmed and disheartened. There was so much plastic everywhere around us as we trekked slowly across the gyre. Derelict fishing gear, nets, lines, and buoys were sighted daily. Following on the heels of the 2011 tsunami in Japan, we were witnessing not only small pieces, but larger debris items like skiffs and refrigerators that the tsunami had swept out to the open ocean. 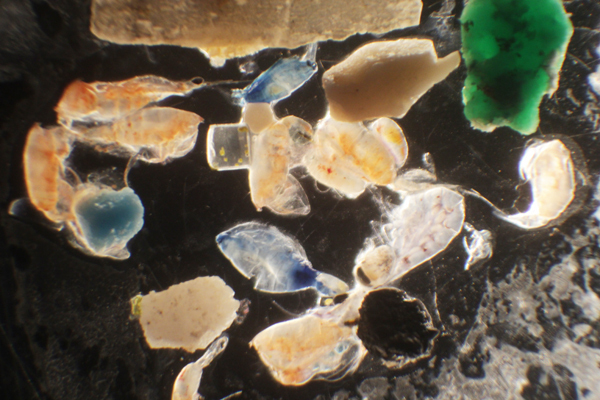 Whereas the larger debris are intuitively upsetting since they are so readily visible, it is these smaller fragments created from the breakdown of bigger pieces of plastic by ultraviolet light and saltwater that are particularly problematic. Seabirds, like the albatross I saw by the millions on Midway Atoll, and fish are eating plastic fragments that are the same size as their typical plankton meals and starving to death because of it. And since plastics are created by long chains of polymers, they don’t ever really break down into their constituent chemical compounds—they just continue to get smaller and smaller. The Great Pacific garbage patch, as it has been dubbed, is not a mountain or island of trash that one simply sails past in the gyre as the media has portrayed it to be. It is much more insidious: it is a soup of these tiny fragments that spans thousands and thousands of kilometers of ocean, these fragments that in 2012 we saw numbering in the thousands in our net tows across the gyre, and these fragments that I continue to see in our nets with every trip I sail. That 2012 trip rattled me: I was forced to confront my own contribution to the problem and was taken aback at how much my awareness and perceptions my own daily use of plastic shifted after this cruise. Suddenly plastic was jumping out at me everywhere- in my shopping cart at the grocery store as I bought a loaf of packaged bread, in the sponge I used to clean my kitchen countertop, in my personal care products that had several layers of plastic packaging, and were often made of plastic themselves. What items had I used in my lifetime that I was now potentially catching as a tiny fragment in our nets? And if I was using this much plastic day today, what about others who had not been able to see these problems firsthand? There’s not much, honestly, that we can do about the plastic that is already in the ocean. As recently as 1988 it was entirely legal to dump plastic waste at sea, until revised regulations of the International Convention for the Prevention of Pollution from Ships, or MARPOL, put a stop to it. 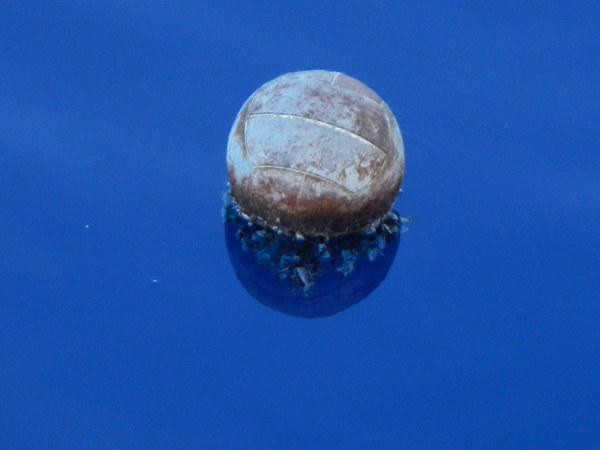 But even with increasing awareness of plastic pollution’s effect on the oceans, many ships often operate in areas where enforcing these dumping regulations is difficult or impossible. Furthermore, 80% of plastic in the ocean originates from land. So what do we do? How do we stop the devastation plastic is inflicting on our oceans and the creatures in it? While addressing plastic pollution in the ocean is proving to be a complicated task, what we can do is address plastic consumption at its source. As consumers, as mariners, we must educate ourselves. One easy solution is to eliminate use of personal care products that contain tiny plastic bits, called microbeads, which often have no purpose other than acting as abrasive agents that can be made from natural materials. Popular toothpastes and facial scrubs are common offenders, with these microbeads getting washed down drains nationwide, eventually finding their way into waterways and the oceans. Research in the Great Lakes, spearheaded by 5 Gyres, is finding microbeads at alarming densities, and legislation in Ohio, Illinois, and New York is underway to help mitigate microbead production. Certain counties in California have banned styrofoam takeaway containers entirely; plastic shopping bags are either falling out of vogue as more and more people become aware of pollution problems, or they are being banned. We are living at a time where the throwaway culture is not seen as an option any more, and greener more sustainable alternatives like reusable water bottles and shopping bags are key players in shifting away from disposables. As scientists, sailors, and concerned environmentalists, it is encouraging to see plastic pollution being tackled at the legislative level, but let us continue to do our own small part to stem plastic from the source. I for one am hoping for a day where I can pull a net on board and be heartened, not discouraged, by what I see inside. Pledge to leave No Trash, No Trail, No Trace and protect the ocean by reducing your carbon footprint by not using single-use plastics. Learn more about plastics in the ocean. Visit www.sea.edu/plastics to learn more about the 2012 voyage, see videos of net tows, and learn more about ongoing research. Educate yourself. Visit sites like www.beatthemicrobead.org to learn what personal care products you have that may contain microbeads, and find out what products are environmentally safe. Seek alternatives to daily single-use items. Larger one-time investments in items that are meant to be durable, not disposable, can save your wallet and the oceans in the long run. Ideas include: cloth grocery bags, aluminum water bottles, stainless steel or glass drinking straws, and even glass storage containers for food in your pantry. Sign 5 Gyres petition to ban plastic microbeads. Be an active citizen. Learn about waste management and pollution legislation in your area, and write to your local state representatives about your concerns.